Yup, that's what it's all about. And I hope that Larkin is well. You make such a great point! I've been in school a month (yes....a month) already, and I've seen teachers devoted to laying that foundation of community. So important! Melanie - welcome back! I've been gone, too, and it feels good to be Slicing again. Your daughters are stunning! I wish you could come visit my new school district during the first week of school. It's a model that should be replicated in every school across the country, high school included. No academics. None. Just community and team building and forming relationships. That's it. Isn't that beautiful?? Our junior high has a "Wall of Students." It has a picture of every student in the building. As a teacher forms a special connection or relationship with a student, they remove their picture. As the year continues, the staff looks at any pictures still remaining because they know those students still need to bond or connect with a teacher. Isn't that amazing? My grandson just started high school & luckily for him he's in the marching band/orchestra-lots of community there. As for the rest, he has so little to say, makes me sad. Former students talk of music & drama, & debate or speech, but little else too. I wish they all had teachers like Deb Day. Her room just created a FB page to share what they were doing-& that's high school! Your daughters look ready to take on many challenges, so tell them to learn outside the box. Maybe it'll make a difference. Have a lovely start yourself, Melanie. I love seeing this picture of your girls. Wow! They shine! 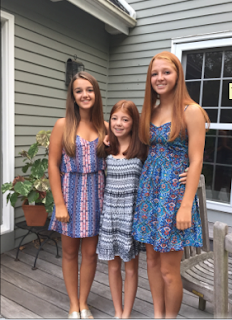 My daughters were very blessed (and we paid a high price) to go to a small private high school. It was like camp with the classrooms in old sugar shacks from a sugarcane plantation. Academics were rigorous but so was relationship building. I do wish the public high schools could understand this important aspect of education. 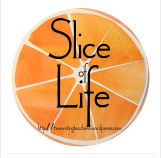 Glad you are back to slicing. Your blog has confirmed that I am on the right track when I am planning team activities for my middle and high school students!! If there isn't a common core standard for that, I will just have to make one! Wishing you and your girls a wonderful new school year!